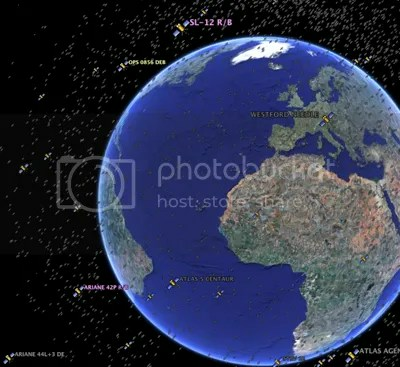 I read somewhere a while ago (most likely Universe Today) about a plug in for Google Earth that shows around 13,000 of the satellites in orbit around the Earth, dead and alive. It’s really quite amazing exactly how many satellites are out there. More amazing that so many are actually no longer operational. It brings home a very real possiblity. A scenario called kessler syndrome. Kessler syndrome, proposed by NASA’s Donald J Kessler is a situation where the Earth has so much debris in orbit that it renders space travel and the use of satellites essentially impossible for generations. It would take decades to, possibly, millenia for all the junk to clear from the skies. All newer satellites tend to be put into low Earth orbit where they’ll eventually burn up in Earth’s atmosphere, but there’s a lot of debris still out there. A lot more since a certain Chinese missile test a few months ago (which increased orbital debris by over 20%). Essentially, the more junk is up there, the more chance there is of it smashing into things. Things like space shuttles. A Kessler Syndrome is a scary scenario, because the more collisions between dead satellites, the more debris will be in orbit, increasing the chance of collisions and so on. The end result we don’t want is a catastrophic event known as an ablation cascade. In an ablation cascade, one explosion causes an expanding shell of debris. 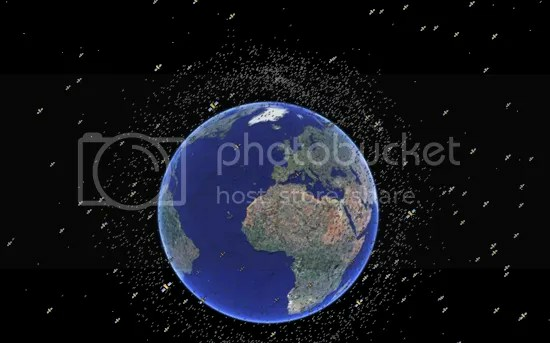 This shockwave of junk punctures successive satellites, causing more high velocity debris (possibly further explosions as coolant tanks are punctured) until Earth is wrapped in a coccoon of pulverised metal shards. Of course, this is an extreme scenario, but seemingly one we should be wary of. Especially if commercial space travel is going to kick off in the next 20 years or so. In the meantime though, it’s really quite staggering. Humanity’s most expensive scrap heap. Strangely, almost beautiful as well… Almost like some kind of man made globular cluster. This entry was posted in Imported from Livejournal and tagged satellites. Bookmark the permalink.